Be the first to share your favorite memory, photo or story of Sharad. This memorial page is dedicated for family, friends and future generations to celebrate the life of their loved one. 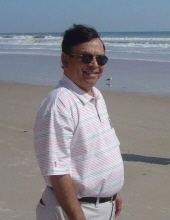 Sharad Bhalachandra Tilak, 75 years old, of Fairfax, VA passed away Monday morning at Kindred Hospital in Dover, NJ from complications with multiple organs. Sharad was the son of Bhalchandra Ramchandra and Sudha Tilak born in Indore, India. He spent his early years between the school that his parents taught at and the home of his close relatives. He was an accomplished student who earned his electrical engineering degree from IIT Bombay, a prestigious engineering school. Later in life, Sharad moved to the United States and earned his master’s degree in industrial engineering from the University of Wisconsin. He was married to Dr. Anu Tilak and together had three sons; Neel, Rishi, and Jay. He spent his last 20 years with his partner and companion, Inge Voigt. He had a long career that began in the private sector with Ford Motor Company and concluded in public service as the Chief Information Officer at the Department of Justice, Federal Bureau of Prisons. Sharad was an only child, father to 3 sons, and grandfather to 5 grandchildren, but a brother and paternal figure to so many. He was generous and kind without expectation of anything in return. He believed life should be spent in the company of friends and family; he will be missed and remembered by those family and friends. His sons will host a celebration of life on February 3rd from 10 AM - 1 PM at Royce Brook Golf Club in Hillsborough, NJ. All are welcome. In lieu of flowers please donate to the American Lung Association or charity of your choice. To send flowers or a remembrance gift to the family of Sharad B. Tilak, please visit our Tribute Store. "Email Address" would like to share the life celebration of Sharad B. Tilak. Click on the "link" to go to share a favorite memory or leave a condolence message for the family.